Poker is the most lucrative game in the world surpassing the NFL, NBA and Golf. It's top five prizes in high roller tournaments amount to a massive $44,202,738! So you can see it really is the most lucrative game in the world. The truth, the legend and the myth – Where did poker start? There are two theories on the origin of poker. First, is It originated over 1,000 years ago in China, where an emperor played a domino-card game. The second and is it came from a Persian card game known as ‘As-Nas’. Some historians point to other more recent games being the origin of poker. All of these games have forms of betting and bluffing, key elements to the game of poker. And whatever it’s origins, one thing holds true – it’s very popular! Poker was popularised in the 1700s and 1800s on the Mississippi river, where riverboat gambling and saloons covered the Mississippi delta and surrounding areas. The type of poker played in the saloons and riverboats dotted around the Mississippi river, were played with a deck of 20 cards. And played with no draw, meaning the best hand wins, after rounds of betting and raising. Again the same as ‘As-Nas’. Eventually it evolved into the game, Poker we all know today, with 52 cards and all forms of play. 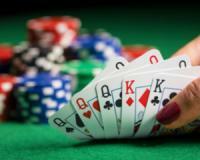 From seven card stud, Omaha Hold‘em and the most popular form of poker, Texas Hold’em. With the advent of the World Series of Poker in 1970, Texas Hold’em became the most popular form of Poker, with online Poker making it even more popular. So let’s drill down into this subtle and deceptively simple game. First things first, before the cards are even dealt, the two players to the left of the dealer have to put out blind bets. The player directly to the dealers left will place the small blind while the second player left of the dealer will place the big blind. The reason it’s called the blind is because the two players haven’t seen the cards. The big blind will place the smallest possible bet allowed, for example, two chips. While the small blind will place half that amount, one chip. Each player is dealt two cards face down. This is called the hole or pocket cards. In the first round, players to the left of the dealer, the small then big blind, each take their turn to either call or raise the blind bet, or they must fold. The betting will follow clockwise. Once the first round of betting is completed, three cards laid face down called the flop, are turned face up in the centre of the table. Once the flop is laid out face up, the betting continues from the dealers left. A fourth card is then dealt face up next to the flop, this is called the turn card. Another round of betting continues clockwise. The final card is dealt, face up. This is called the river. A final round of betting occurs after the river is dealt face up. The remaining players each show their cards in the order the betting took place. The person who can make up the best five-card hand (Combining the two cards in their hand with the five cards on the table) will win. 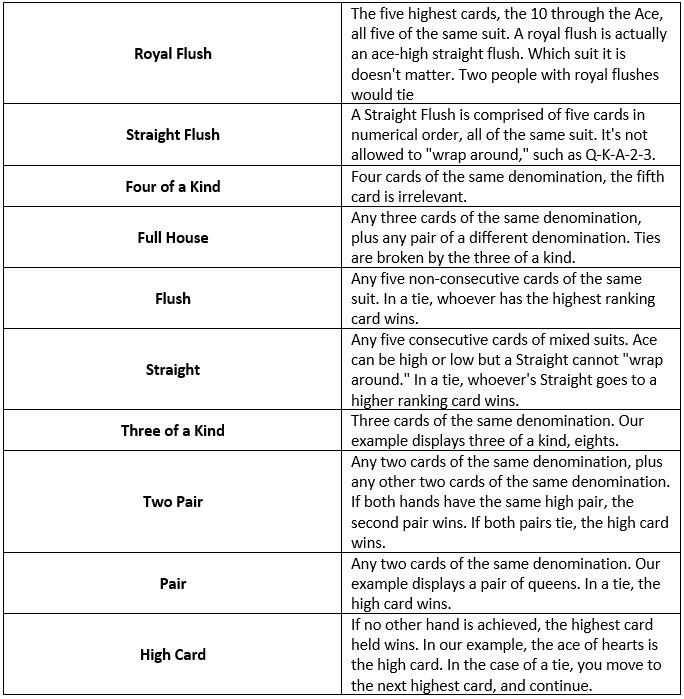 What makes the best five card hands? 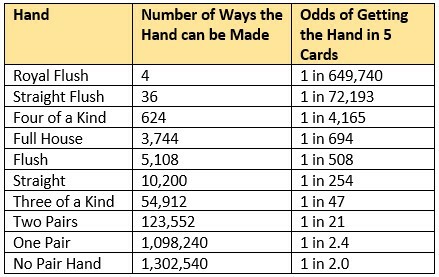 With a 52-card deck, there are 10 possible five card hands that you can get. In order of best to worst, here are the 10 best five card hands. I’m releasing 300 FREE copies starting today so if you want to reserve a copy of one of these 300 right now, simply claim your copy of Little book of Big Income Secrets here. The aim would be to try to get the top five best hands, however, they are hard to come by. Now you know how to play and what to aim for, in next week’s article, we will look at advanced strategies such as playing the Flop, the Turn and the River as well as some bluffing techniques. P.S: Poker has a lot of attributes that are good for sports betting... Dicipline, strategy and skill are what make great poker players as well as profitable sports bettors... Join the winning streak today and profit from this weekends sporting events.